Plastic is an excellent material for durability and it gives print pieces a modern, sophisticated look. Additionally, items printed on plastic can be placed almost anywhere because they work well in environments with high humidity, they won’t deteriorate when wet and won’t tear apart when handled under harsh conditions. Plastic labels are available in a wide range of thicknesses, making them versatile products for a number of applications where durability is a must. Ironically, in an industry where the core products are “naturally” growing organisms, such as plants, trees, flowers, fruits and vegetables, the horticulture industry is a market where plastic labels and plants are almost happily living together side by side. But with the current growing concerns about our everyday relationship with disposable plastics, you could be forgiven for thinking that plastics, in particular, should be banned from this industry. More than ever, in a competitive market, plant growers and garden centres require informative labels and point of sale signs to attract customers to their large range of products. The labelling needs to be just right to market the plants themselves and make them stand out from the competition; it needs to be informative, colourful, eye-catching to help the end-users/customers choose the right product and provide enough aftercare information once purchased. 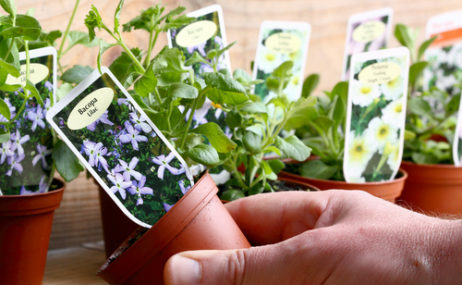 But most of all, these labels need to last, to withstand the variable outdoor conditions and repeated watering while being on show either at the growers, the garden centre or in-store. And while wood-based paper products, naturally produced from our forests, could sound like a more environmentally-friendly solution, papers laminated for improved durability will still show signs of weakness, particularly around the edges where water can easily seep between the paper and the lamination film. This is proving that laminated paper-based labels or tags could not possibly hold up to the expected conditions over time, ending up looking too dirty or shabby after repeated exposure to humid conditions. Furthermore, adding lamination to improve durability does not reduce the use of plastic – on the contrary, it makes it a poly-material product difficult to recycle. In most cases the recycling process involves shredding the paper-plastic laminate without removing the plastic lamination, which will invariably end up in a landfill. 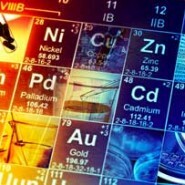 Nowadays plastics have gained bad press due to sustainability concerns around recyclability. While this may be true with some plastic materials such as PVCs, those made from PET and PP are a lot kinder to the environment in terms of the production process and are easier to recycle. 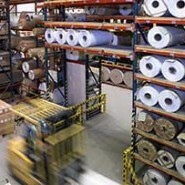 They are certainly better than laminated paper solutions, which can neither be recycled as paper or plastic for the reason mentioned above, nor, more importantly, can match synthetics’ outdoor durability and tear resistance – the very thing that makes them ideal candidates for horticultural labelling demands. Traditionally, horticultural suppliers would offer all seeds listed in their catalogue along with the appropriate labels, tags or stabbers. This would save growers a considerable amount of time and labour cost by avoiding the need to produce their own labels for the crops at the time of potting and packing. 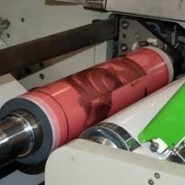 Usually supplied in high volume, this solution allowed for a longer runs of labels (printed Offset or flexo) to keep the production cost very low. Alternatively, there are growers purchasing ready-printed labels separately for a more flexible approach, who personalise the data by thermal print transfer process, thus making their supply to retailers more flexible. Moreover, some growers are setting up their own nurseries with onsite print rooms producing their own bespoke labels on demand, allowing them to personalise the finished article to their customers’ specifications. They are often equipped with 2 or 3 medium sized laser printers and finishing cutting equipment to offer shorter run flexibility to the smaller garden centres. Producing lower volumes of printed tags is another fantastic way of trying to be kinder to the environment and with the benefit of digital printing, it is now possible to print the exact amount of tags and labels needed by the growers onsite, as well as retailers – even at a store level. Similarly to some growers, garden centres are also taking a step further. They prefer the convenience of printing their own labels, reducing the amount of production waste and the added benefit of having the flexibility of personalising each tag and label, even down to their store logo, with a minimal financial investment. There are now specialist firms supplying software in a ready-to-use package, combining a bank of high-quality photographic images with an easy-to-setup, pre-designed templates. Alongside it, there is a relatively small desktop laser printer and pre-designed perforated synthetic tags, wrap-around collar labels or even plant stabbers which, once printed, can be separated and used immediately. An attractive proposition especially for smaller garden centres! With optimised print performance and excellent outdoor durability, ready right from the printer output tray without wasting time and resources on any extra lamination processes, KernowPrint® Dry Toner is the perfect digital synthetic solution. KernowPrint® Dry Toner offers growers and garden centres maximum flexibility from one single print to thousands, saving both time and money with outstanding print quality combined with the strongest construction to withstand strenuous conditions. To learn more about how KernowPrint® Synthetic Print Media can help you elevate your prints and drive home new business within the Horticultural market, contact Kernow today at sales@kernowcoatings.com. Our team of experts can help you develop the best print solution with the perfect material to leave your customers wondering why they didn’t think of it before! Kernowprint® Dry Toner, a collection of PVC-free, synthetic media because you need something tougher for longer. Designed for digital laser/toner printers and copiers.